The diversity of life represents the single most unique and valuable asset of our planet. Yet, our understanding of biodiversity in the world's oceans is still rudimentary. Through my work as a marine biologist, I seek to uncover biodiversity patterns in the ocean and their effect on the functioning of marine ecosystems. I am currently a Banting postdoctoral research fellow, working in the Marine Ecology Lab at the Earth2Ocean group at Simon Fraser University. From 2015 to 2017, I was a postdoctoral fellow for MarineGEO, located at the Smithsonian Environmental Research Center in Edgewater, Maryland. I obtained my PhD from James Cook University in Australia in 2016. Of the millions of life forms present in the world's oceans, more than 15,000 are fishes. An additional ~5,000 species of marine fishes have yet to be described. My research seeks to shed light on the ecology, evolution, behavior, and life-history of fishes, with a particular focus on the "cryptodiversity" of cryptobenthic coral reef fishes like gobies, blennies, or triplefins. All ecosystems are dependent on a complex mosaic of interrelated ecological processes. 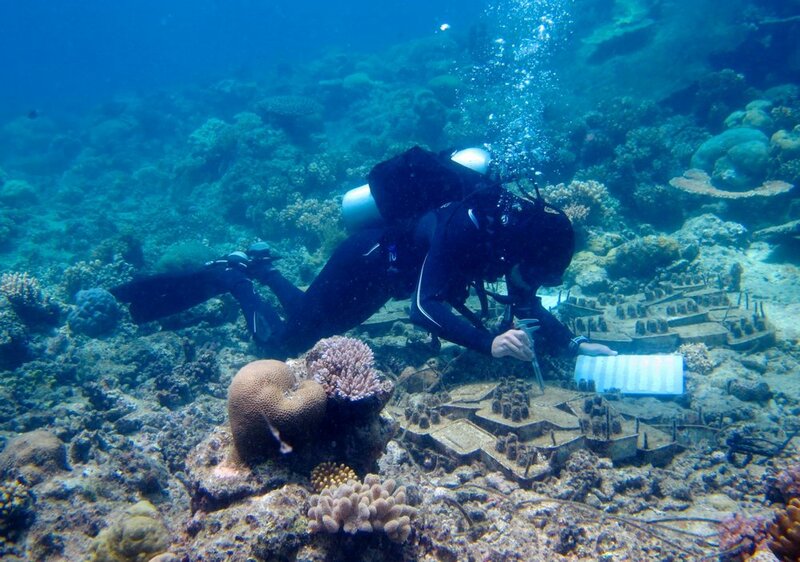 I am interested in disentangling and studying the core ecological processes that govern coral reef ecosystems, with a particular emphasis on the role of biodiversity for processes such as herbivory, predation, or secondary production. We are witnessing an era of unprecedented human impact on ecosystems across the globe. Through my research, I hope to gain information on the effect of disturbances on ecological communities, their capacity to buffer disturbances, and the potential actions we can take to bolster ecosystems against future environmental change. Deploying the first generation of fish-specific autonomous reef monitoring structures (FARMS) in Bocas del Toro, Panama. A beautiful (and particularly chunky) specimen of Priolepis freshly caught on a reef in the Gambier Archipelago. Returning to Carrie Bow Caye, Belize, after a successful dive outing. Running a visual census on the Belizean Barrier Reef. Measuring and tagging sharks in Bowling Green Bay, Australia. These two butterflyfish (Chaetodon ulietensis) were curious about my ragged dive gloves. Our Swains-Research team getting ready for a dive off the tender. Measuring algal turf filaments on Lizard Island, Australia. Please find my latest publications below. Follow this link to a list of all of my publications, or access my Google Scholar or ResearchGate page using the buttons below. For information on my reviewing activities, go to my Publons profile. In this paper, we provide the first quantitative definition to delineate a core group of cryptobenthic fish families, showing that size-distributions within families produce a remarkable separation between 17 cryptobenthic and 41 large reef fish families. We further model the rates at which reef fish species have been (and will be) described from the mid-1700s until the year 2050, predicting that by the year 2032, 17 families of cryptobenthic fishes will account for more than half of the described fish diversity on coral reefs. We highlight some of the processes that may have given rise to the extreme species richness of cryptobenthic reef fishes. In addition, we emphasize the paucity of quantitative data on crypto-assemblages worldwide, both geographically and across depths. Finally, we summarize some of the most salient limitations that small body size imposes on the ecology of cryptobenthic reef fishes and detail adaptations that permit these organisms to flourish and occupy a unique functional role on reefs. It's all you ever wanted to know about the smallest marine vertebrates (or at least a good start -- lots more to be discovered). In this paper, my co-authors and I show that marine dock pilings, a habitat that is becoming ever more prevalent on the world's shorelines, can foster diverse assemblages of native, regionally characteristic cryptobenthic fishes. These assemblages appear to follow traditional ecological paradigms, like the Latitudinal Diversity Gradient, as their species richness declined sharply from Panama to Maine. We suggest that, in contrast to findings from sessile epifauna, dock pilings can provide a valuable habitat for the conservation and monitoring of vertebrate biodiversity in heavily anthreopogenically impacted environments. In this short opinion piece, Chris Goatley and I provide a short introduction to the life (and death) of cryptobenthic reef fishes. What are cryptobenthic fishes? What do they do? Where do they occur? And why should we care? Check out the paper to find the answers to these questions and take a moment to appreciate the extraordinary diversity of the shapes and colors of cryptobenthic reef fishes. A squidpop, investigated by a curious striper (M. saxatilis). In this paper, my student Jon Rodemann and I used a standardized predation assay to test whether consumption pressure increases towards the tropics. Using "squid-pops" (i.e. a piece of dried squid tied to a garden stake) deployed underneath and a short distance away from marine dock pilings, we show that consumption pressure decreases sharply from Florida to Maine. Stay tuned for the full paper to be published in MEPS! 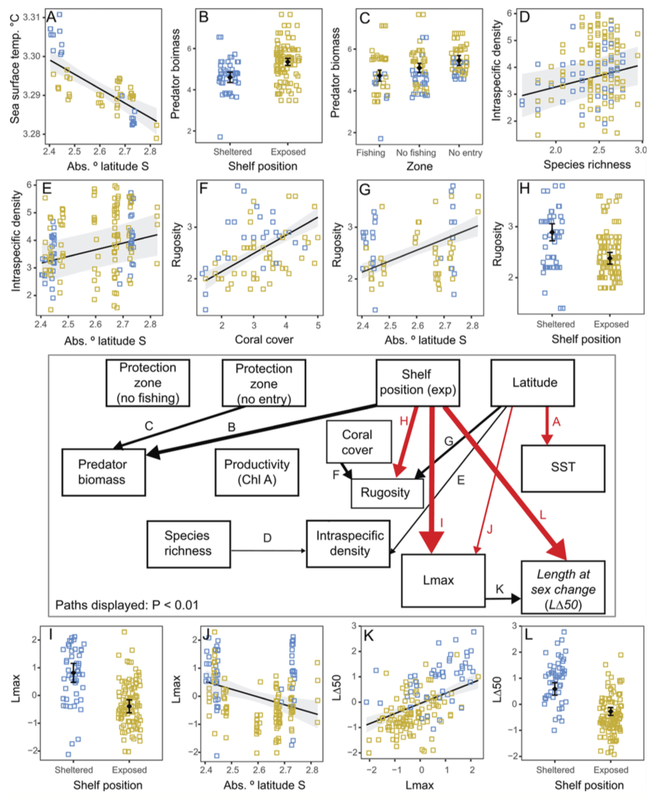 Functional changes in the reef fish communities around Lizard Island afetr Cyclone Ita. What happens to the functional composition of reef fish assemblages after a major disturbance that decreases coral cover? We answer this question by determining the functional community structure of reef fishes on Lizard Island before and after Cyclone Ita pummeled the island in 2015. Using functional diversity indices and Bayesian models, we demonstrate that reef fishes become more functionally unique after the disturbance, suggesting that species with common, widely shared functional attributes are being lost. In particular, the many small, planktivorous fishes that require coral for shelter appear to be the most affected species.